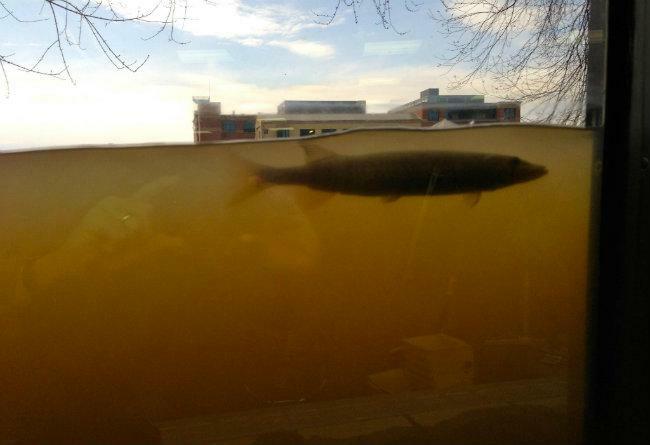 The Grand River hit a record high level in Grand Rapids over the weekend. Volunteers spent hours filling sandbags to protect homes and city buildings. City managers are still dealing with the flood waters. But they’re also planning for future storms. Haris Alibasic directs Grand Rapids’ Office of Energy and Sustainability. “Given the more intense and more frequent, intense rain events we’re probably going to be experiencing, as climate change is anticipated to really have a serious impact in the Midwest," he says. He says the city has already done a lot to improve how it handles stormwater. Grand Rapids has almost finished separating its stormwater and sanitary sewer systems. That cuts down on the amount of raw sewage that can get into waterways during a storm. But city officials want to do more. Mayor George Heartwell’s office is getting help from the West Michigan Environmental Action Council. The group is working on a report for the city. It’ll look at ways to help Grand Rapids adapt to climate change, including getting ready for more intense storm events. Rachel Hood is the group’s executive director. She says southern Michigan has lost more than 50 percent of its wetlands. “And wetlands are one of nature’s great resources for managing stormwater," she says. So, she says we can try to mimic nature in our cities to get prepared for future storm events. That could mean doing things like making green roofs (planting greenery on rooftops to absorb water)… and creating porous pavement. “Water falls onto that pavement and rather than running off, picking up pollutants on the way, it just drips into a layer of sand and then into a layer of rock, into the groundwater system,” she says. Hood says they’ll get a draft report to the city of Grand Rapids next month. 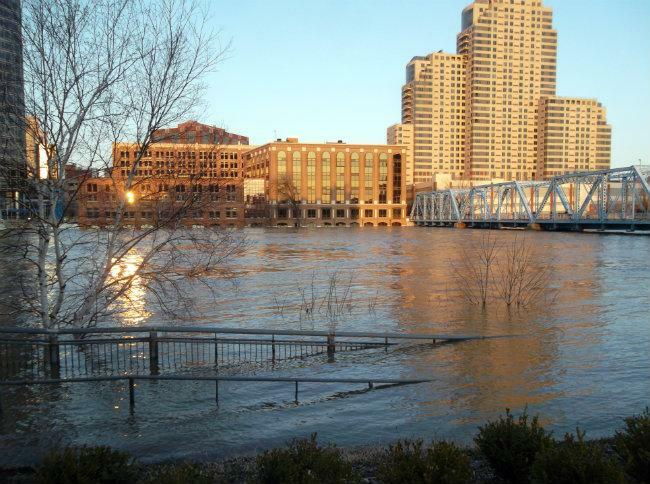 This post was updated as we learned news related to the rising waters in West and mid-Michigan. To see how events unfolded from Friday through Sunday night, scroll down and read up. To read about current news related to the flooding, see this new post. Sunday, April 21st, 9:30 p.m.
At nearly 22 feet, Michigan’s longest river is very near where the National Weather Service is predicting it will crest in Grand Rapids. The Grand River’s flood stage there is 18 feet. City officials were confident the waste water treatment plant (that serves around a dozen other neighboring communities) will make it through the night, thanks in part to a massive sandbag wall lining the perimeter. Over the weekend the city moved around $3 million dollars in equipment that’s not needed for the emergency to drier locations, just in case. The flooding means the plant is processing more than triple the usual amount of water. Over the last three days, the city says the plant has treated 150 million gallons of water a day, compared to an average of 42 million gallons a day. People are still being asked to conserve water; take shorter showers, hold off on washing laundry and dishes. “We expect to be safe through the night,” the city’s Environmental Services Manager Mike Lunn said in a written statement. “The combined performance of our flood walls, our pumps, professional staff, and volunteers has been truly amazing. We must, however, continue to be diligent in monitoring the situation,” Lunn said. The city is no longer calling on people to help fill and move sandbags, for now. The crest will head to Grandville soon, where the city library is now taking on some water in the basement. In Lowell, upstream from Grand Rapids, the water is already beginning to recede. There’s been very limited access into the city, with a number of bridges closed. But the barricades are predicted to move off Main Street before the Monday morning commute. Electricity is being rerouted in Grand Rapids because of the flooded Grand River. Officials from Consumers Energy said Sunday there are four high voltage distribution lines that run just under the Fulton Street bridge. The water is high enough there's a concern that big trees or other debris floating down the river could snag the lines and cause safety concerns so they’ve de-energeized the lines. Electrical services have not been impacted because of the move. Once the river recedes they’ll reopen the bridge. But officials couldn’t estimate how long that will be. The Grand River is expected to crest Monday around 2 a.m. at 22.3 feet. At a press conference Sunday afternoon Mayor George Heartwell thanked the hundreds of volunteers who’ve been filling and stockpiling 6,000 sandbags an hour over the weekend. He called for more volunteers this afternoon and evening. Rain is in the forecast as early as Tuesday. Michigan’s second largest city remains under a state of emergency because of significant property damage to a number of buildings in the downtown area. It’s estimated that around a thousand residents in mid and west Michigan have been evacuated from their homes. Some have already been able to return.